I was panicking today, because I didn’t have a photo to enter in BIBPC. I couldn’t think of anything to photograph. Literally everything has texture, so I was thinking about taking a picture of a random thing. XD But then I thought of food! Food is interesting, right? I picked Ramen noodles, because they’ve got a pretty cool texture. I’m still panicking, actually, because this is late. I was supposed to have posted this by 5:00 . . . and it’s almost 6:00. :'( I’m really sorry, Megan! I was still doing school. I understand if this doesn’t count. Megan let mine in, so if you post yours quick, she might let it in, too. Megan is letting me post mine a day late, because of the storms here. Maybe you can post yours later. Thanks! I dunno; I checked her post several times, and it said that 26th. I guess she changed it, then. Have you seen The Peanuts Movie? Your rooster, right? I’m sorry. :( But I think you can still enter a photo! Megan extended it a day. Yes. It’s an awesome movie you should consider watching it. 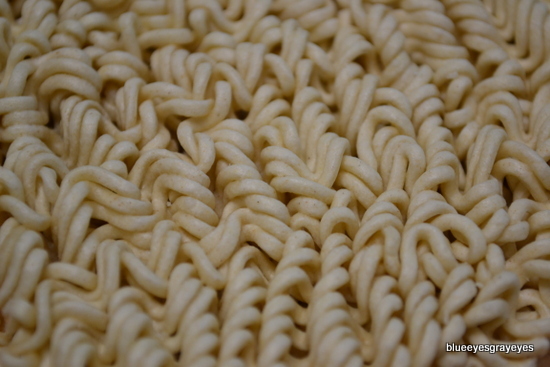 Ramen Noodles have an awesome texture. I’m weird, so naturally, I once ate a whole entire pack. dry. No flavor, nothing. And the weird thing, it tasted good. It’s great. I command you to watch it. I love this photo! Ramen noodles are the best.